With compounds roughly 300 times as sweet as sugar and virtually no calories, stevia offers a more natural -- but still processed -- alternative to artificial no- and low-calorie sweeteners. 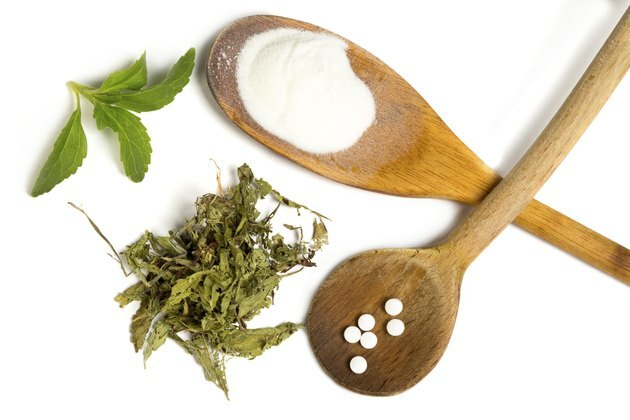 The Food and Drug Administration has classified stevia as a dietary supplement and, as is the case with other supplements, has not evaluated it for safety before it hits the market. While there are no long-term studies on any form of stevia, including Pure Via, there's also no evidence it presents a serious risk of side effects. Pure Via sells stevia powder, plain and flavored stevia liquid and powdered stevia blended with turbinado sugar. The stevia liquids and plain stevia powder are all naturally calorie-free. They also contain small amounts of additives -- the powder has added dextrose, while stevia liquids have potassium sorbate, citric acid and sodium benzoate. Stevia blends are additive-free and just contain stevia extract and sugar, but each packet has 5 calories. There are no confirmed side effects of including stevia in your diet, reports Go Ask Alice, a health and nutrition education service provided by Columbia University. While some preliminary test tube studies have linked stevia to genetic mutations -- a driving force behind cancer development and cellular aging -- there's no evidence that stevia has the same effect in your body. While stevia is not a common allergen, you could theoretically experience an allergic reaction to any stevia product, including Pure Via. Check the label before buying -- if you're allergic to stevia or any of the other ingredients in Pure Via, don't buy it. Using sweeteners regularly, however, might affect your sense of taste, increasing your cravings for sweets, explains Harvard Medical School. This side effect is not specific to Pure Via but applies to any artificial sweetener. Pure Via's stevia blends have the potential for other side effects because they contain a small amount of sugar. Added sugar offers no nutritional value and contributes to tooth decay, weight gain and several chronic diseases. Each packet of Pure Via Blends has 2 grams of sugar -- half a teaspoon, a small but significant amount toward the 6- and 9-teaspoon limit for women and men, respectively. Protect your palate by using Pure Via in moderation. Add Pure Via to your coffee in place of sugar, or add it to veggie-rich smoothies if you need to improve the taste. Because pure stevia can significantly change the flavor of your food, try Pure Via stevia blends in baked goods as a lower-calorie alternative to sugar. Use half the volume of Pure Via stevia blends in your recipes -- for example, 1/2 cup of stevia blends replaces 1 cup of sugar. Harvard School of Public Health: Artificial Sweeteners: Sugar-Free, but at What Cost?